Second edition of this early edifying book. Enhanced by 42 additionally inserted full-page gouache paintings by a German artist. 148 x 90 mm. – ff. , pp. 352, [additional 4 ff. in manuscript]. 3 pages decorated around margins, 1 full-page engraving illuminated, 42 full-page gouaches. While a typical German edifying book of the beginning Baroque period of German literature, this is a remarkable copy of a very scarce edition. As the book is, moreover, highly embellished with painted illustration, it is also – and above all – a charming piece of art. The author, Jakob Zader (1555-1613), uses winter and summer as allegorical representations of the earthly and eternal lives of the faithful. 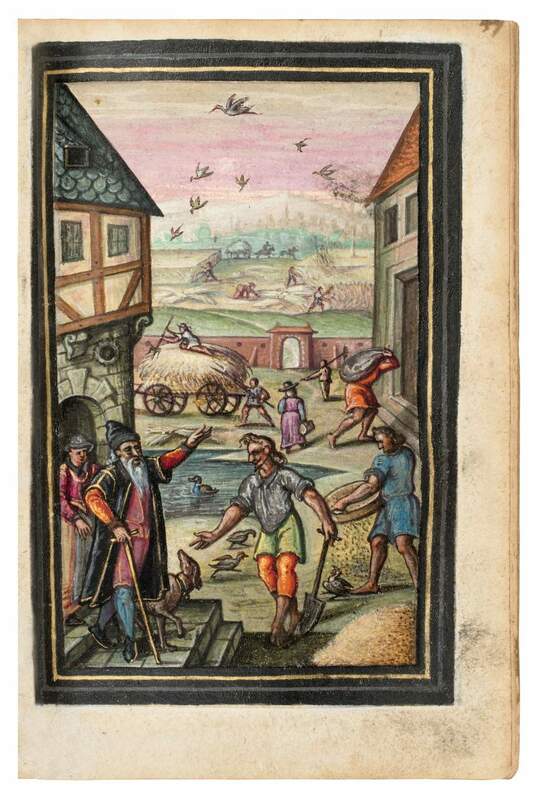 Our copy is abundantly decorated with additionally inserted colourful images, which offer charming vignettes of contemporary country life, such as wild landscapes, gardens, and husbandry, showing wild and domestic animals, farmers working the land, a shipwreck, craftsmen in their workshops, as well as devotional and allegorical scenes. While several features of the gouache illustrations suggest various stylistic influences, the identity of the artist(s) who dated and monogrammed the initials AV and NG on some of the miniatures remains unknown. This work is now in the collection of the Walters Art Museum as W. 937.